The leader of the indigenous people of Biafra, Mazi Nnamdi kanu has marked one year in detention yet he did not derail nor give up in the restoration of Biafra. He proved that it is not every Igbo-Biafrans that you can enticed with money or material things and has also proved wrong those who always said that Igbo-Biafrans like money by refusing any offer and benefits from federal government of Nigeria in order to back off the Biafra restoration. His song is always "Biafra or death". There have been many occasions by which court of competent jurisdiction has ordered for his release which Muhammad Buhari the dumb president disobeyed. But since Buhari's disobedience and refusal to release him, I must tell you that it won't be well with him and Nigeria. Nigeria is now facing one calamity to another and more he keeps Nnamdi Kanu in detention, the more calamities will continue to befall Nigeria. They thought that " Touch not my anointed and do my prophet no harm" is just a mere saying. They don't know that it has a critical outcome. Buhari by his foolishness and ignorance popularized Nnamdi kanu by arresting him and also made the news of Biafra restoration explosive even to the utter most part of the world. 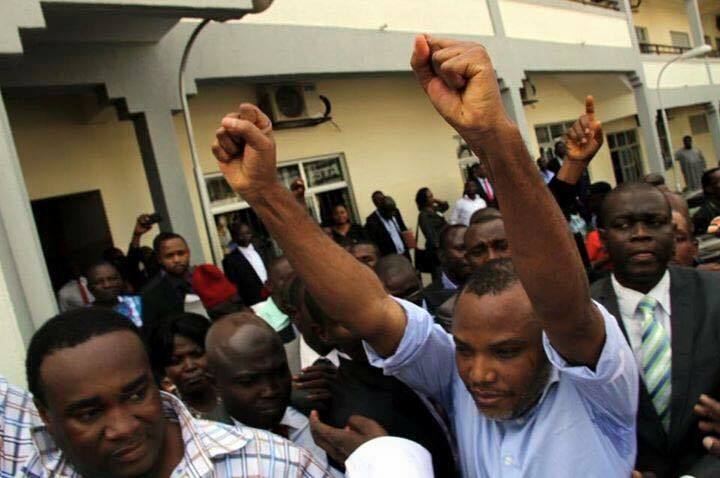 Nnamdi kanu has proved that he is a true leader, whiter than white and a leader who leads by example. Even in the face of challenges and torture, he still stands firm. In fact he is a man whose heart is the chamber that holds his conviction. Why do his followers believed in him? You may ask, well his followers believe in him because he is a man that stands by his words and also a man who is fearless before his enemies. He also puts hope into the mind of his followers. The belief and the convictions of a leader regulate the nature of his leadership. Before, many people didn't believe on the preaching’s of Nnamdi Kanu, some saw it as a hateful message while others viewed it to another different dimension. But today, all he has been preaching and saying are happening one after the other, many people now begin to believe him because the evidence is there for all to see. Truly, Nnamdi kanu is born to be a leader and also to restore Biafra. At some point, a mother bird will nudge her baby birds out of the nest, as if to say, “You need to do what you were naturally born to do," and they will either start flying or risk falling out of the nest. The same is applicable to Nnamdi kanu in the sense that he is naturally born a leader. You can "fly" when you tap into what you were born to do. A true leader is one who is honest, straight forward, loyal, tolerance, and there is no manipulation or deception in him. And in all, Nnamdi kanu possesses the whole quality that a true leader should possess. Nigeria government thought that Nnamdi kanu will be like Uwazuruike who sold his birth right for just a portage of yam. He succumbed after being offered money to back off for the restoration of Biafra and thereby keeping his followers stranded. When Nnamdi kanu came, many people begin to compare him with Uwazuruike not knowing that there was a big difference between an Eagle and a chicken. People thought that Nnamdi kanu would disappoint them just like Uwazuruike and people begin to say all manner of things against him but today thank God the reverse is the case. Nnamdi kanu has not disappointed his followers and Biafrans at large and has no plan to do so even at the course of time. They have offered him heaven and earth in order to denounce Biafra but he still stood his ground by saying that "Is either Biafra or death" And when he was arrested newly, on the 14th of October, 2015, barely a year now, many people are of the opinion that he will derail after he might have gone through series of torture just as Uwazuruike did, but today he has proved all of them wrong. He still stands on what he believes in and has no plan to surrender. Biafra restoration is a project that was ordained by God himself and Nnamdi kanu is also the right person to pilot the affairs of this noble project. My prayer is that God will continue to give him more grace, strength and enablement to bring this Biafra restoration into a reality. He will live to lead us into this promise land ' Biafra' which is the last miracle on earth. No matter how Buhari and his murderous DSS may try to terminate him, since it was God who called him for this mission, their plans against him will continue to fail until he is released. While Biafra must come under his watchful eyes and there is nothing anybody can do about that. Free #Nnamdi kanu, Fre e #Biafra.